Mohamed Geraldez is a successful American Muslim entrepreneur, public speaker, and investor in a few different industries, such as JaanJ, the first and largest vegan necktie company in the world; Scholarview, a site that beautifully curates and organizes high-quality Islamic lectures into one site; and Techhunter (acquired), where the best deals for tech gadgets on the Internet can be found. He actively invests in various commercial arenas and is a strategic adviser to Pivotshare, a digital media distribution and monetization startup. 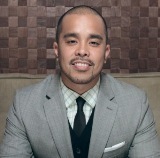 Mr. Geraldez has served as an advisory board member to several entities like GeniusCo, an Information Technology Consulting Firm, and the American Muslim Consumer Conference group, which hosts the most important yearly gathering that connects leading American corporations with American Muslim entrepreneurs, companies, and investors. Mohamed was the first Executive Director for the ALIM Program, co-founded by Dr. Sherman Jackson, where strategies are being developed for the future of Islam in the modern world. Currently, Mohamed is raising capital and looking for more investors to bring his newest and most challenging endeavor, ReCenter Finance, to market in a meaningful way: Shariah compliant student loans in the USA. He briefly speaks about Halal student loans in this video.